That's right, we have decided it is time to celebrate all the changes and renovations that are happening here on the boards, and what better way than to have a BLOCK PARTY?! 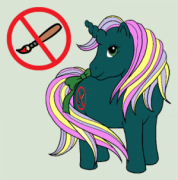 We want to celebrate everything that makes this community great, our members (and of course PONIES), so over the course of the next few months (yes, MONTHS) there will be official games, contests, and swaps all geared toward our members having fun and getting to know each other better! Our lovely 20th Anniversary mascot, Lavender Letters, was designed and named in 2016 (take a look here) and is the official hostess of all our Block Party events. So keep your eyes peeled for her showing up in threads in the near future! What Will Pinkie Pie Do? We are pretty excited to get things started! And we hope lots of ponies will join in the fun! The first game is up! Check out the What Will Pinkie Pie Do? game in MLP Discussion!! You can also always click on any of the "Currently Running Events" to be linked directly to the active thread. Wow, months of events!! How exciting! I remember the contest for Lavender Letters, I think she's such a great mascot! We're gonna party like it's 1999! Whoooo! But I want to party like it's 1634. I wonder what that party would look like...? We could celebrate Cornelius Vermuyden begining to drain of The Fens to reclaim farmland. More new events up and running!! Follow the link to the event post by clicking the name of the event under "currently running events." Don't miss out on the Easter Swap! Signups end today. And now Wacky Caption Contest is up and running! Join in on the fun! There's a new mystery up in the MYSTERY PONY GAME! Be sure to check out the TP's very important fundraiser going on for the next month! Donate to help support our beloved forum and be entered into our prize raffle!! Never Have I Ever - PONY EDITION coming later today!! !